This is the end of the first part of our prequel arc! We’re going to take a day off because friends and family are visiting this weekend, so see you Monday! Also: I’m trying to do a few little things with my coloring to make it less flat. I’ll probably have to go back and tweak this whole story if we want to get it published, so it looks uniform, because I’m not going to stop improving throughout. But that’s ok! ALSO: You know Comic Chameleon, the app that lets you read our comic (along with many others) on your iPhones? Well, they are having a kickstarter to fund an Android version! Please check it out! This oddly reminds me of the black knight from Monty Python and the Holy Grail. Guess Blank is calling it a draw. Also, Skärva’s plans really aren’t very good, are they? Granted, drowning the entire continent thing was a bit hare-brained, but if Blank hadn’t had that sponge he probably would have at least won the fight..
Only step 3 is always “be defeated by Blank in single combat” and step 4 never materializes. Yeah, as I was explaining to Tre below, Skärva has always wanted to prove his superiority while operating within the traditional system. It’s an honor code of sorts. That’s why he doesn’t just send someone to kill Blank in his sleep or something. That would prove nothing about Skärva’s own prowess, just that he’s a jerk and that he hates Blank… but we knew that already. It’s not about getting the hero out of the picture so much as seeing the hero stumped, humiliated, defeated, unable to continue. But that’s never happened. And yes, continuous failure and bad luck is an implied part of the curse. He wants to beat the hero and the gods in their own game? That does make sense. Personally, I would say only transcending the system is proof of superiority, but that’s just my reading of Nietzsche speaking. Man Veronika almost looks like she feels bad. Last night I had this huge dream about a beat Skärva who was feel really sorry for himself and such. It was kind of depressing. Funny that I should wake up and read this page today. Between what was basically a death threat of him being “tired of skarva” at the end of that one adventure and this it seems like Blank is a pretty brutal hero. I mean a lot of “heroes” in games and even other media probably seem very questionable if you look at it from the villain’s perspective or certain angles but something about Blank makes him seem a little more unnecessarily rough with his enemies than the usual hero. Blank don’t take that bucket with you young man. It’s not yours. He’s a hero! Everything he finds belongs to him! Pretty much. Spoils of war and all that. Every page the pity gets worse. No wonder Skarva snapped and decided to do something like he is currently. He and every family member he can remember have been doing the same thing over and over. He wants freedom, to be successful. He knows he will get neither of those doing what he has been doing. Makes me wonder what will happen with Blank though. If Skarva really pulls this off Blank won’t be needed anymore. Skarva will have freedom from his curse…and maybe will just say screw it to being a villain. I would think Blank would see that as a threat. 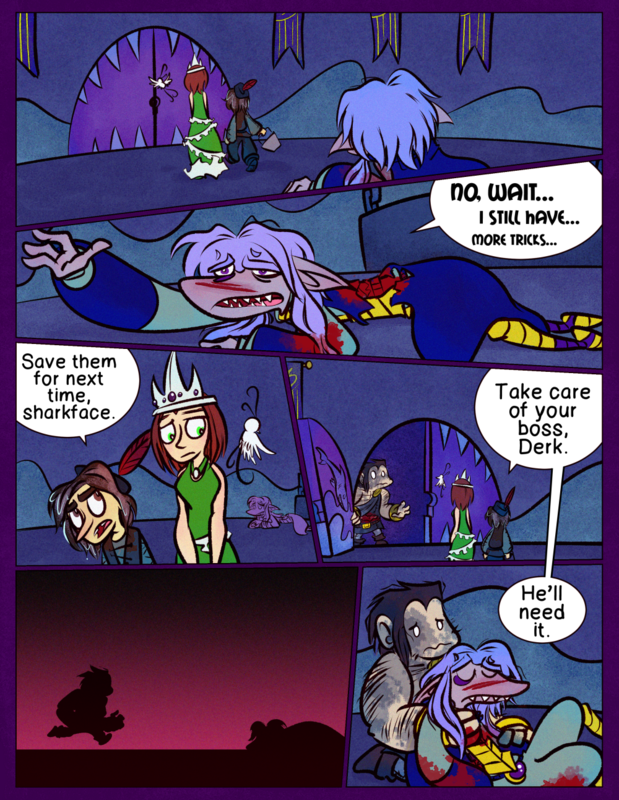 Especially since the Princess seems to sympathize with Skarva quite a bit. Yeah, you’ve hit the nail on the head. He’s very much a lawful evil and always wanted to prove his superiority in both power and cleverness over the gods’ hero from within the system in which he was raised. But enough is enough. Yeah, Blank’s response once he starts piecing together what’s going on is something I look forward to portraying eventually. Ok, you don’t have to answer since it would be completely spoilerific…but role reversal? Just a little bit? You’ll have to see when it comes to that! Don’t worry Skarva, there will be next time… and the time after that… and time after that…..